Episode Fifty Three: We keep Portland Weird. The BrothersGeek record in a posh Portland hotel room. Chris is there for work, Andrew is a freeloader, and Patrick lives there (he mostly sleeps under the 312 bridges that cross the river). We catch up (because if you didn’t know, we haven’t recorded in a fair bit of time). We are hyped for Captain America: Civil War (which we see later on that day). We are hyped for Game of Thrones and Penny Dreadful (which are back with new episodes). Chris has caught a bit of a PvP bug with Destiny’s latest Iron Banner event (Andrew gets to rank 5). All are reading Black Panther and Power Man and Iron Fist (some are more caught up than others). Andrew describes a night of trivia triumph (the Boys try to not act impressed but they really are. Like a lot). (Am I using enough parenthetical phrases?). 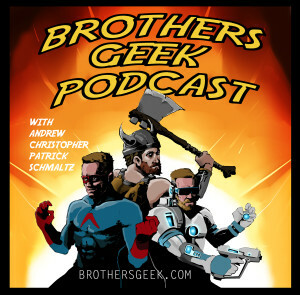 This entry was posted in Podcasts on May 13, 2016 by BrothersGeekadmin.